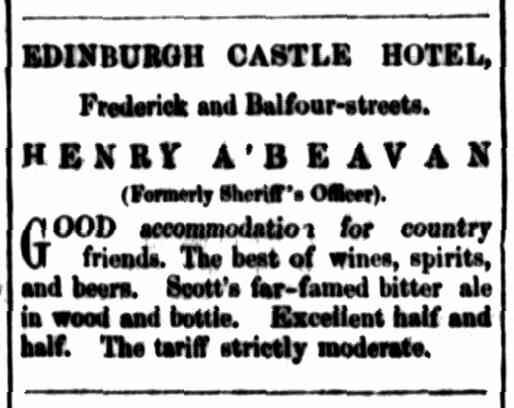 Henry Reading,” Edinburgh Castle,” Bathurst street, The police magistrate called attention to the fact of Mr. Reading having frequently closed his house for two or three days together. Mr. Reading, in explanation, said it was true lie had closed his doors for a time, but he wished to know if any part of the act compelled a publican to keep his house open ; besides customers were so scarce as to render attention at the bar next to worthless. The votes were taken, when there were two for, and twelve against. Refused. 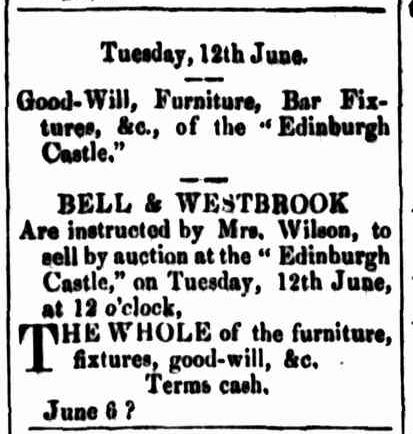 The renewal of the license to the Edinburgh Castle, was refused, on the ground, that there was little use for it in that neighbourhood. 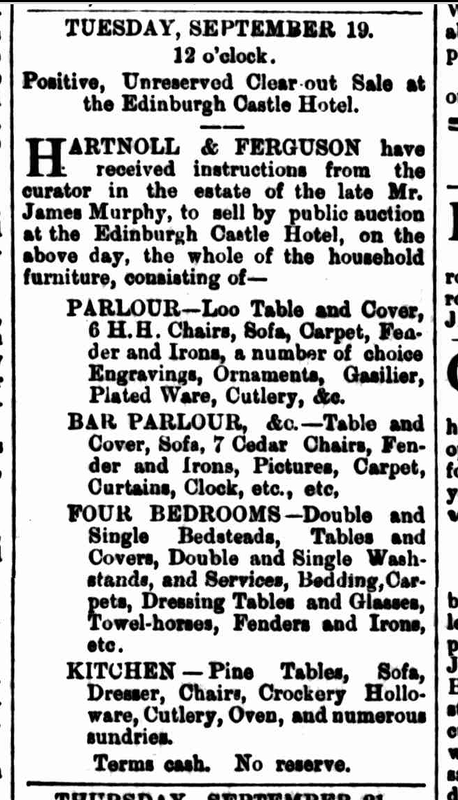 Three transfers were applied for and granted the first, from Thomas Fogarty, “Coach and Horses,” Charles-street, to Thomas Brookery ; next, from Henry Reading, “Edinburgh Castle,” Bathurst-street, to William Martin and the third, from Thomas Jones, ” British Hotel,” George Town, to James Wilson. 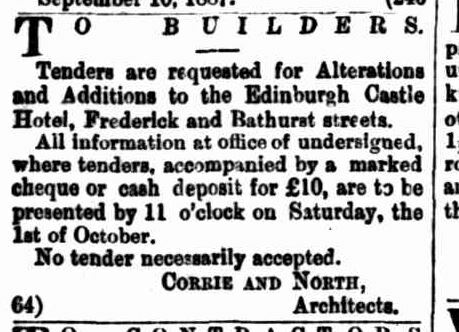 For the diversion of the inhabitants residing in the locality of Bathurst-street, Martin, of the “Edinburgh Castle,” intends having a drake hunt [at Christmas], after which, dancing will commence, for which purpose he has erected a booth at the rear of his premises. 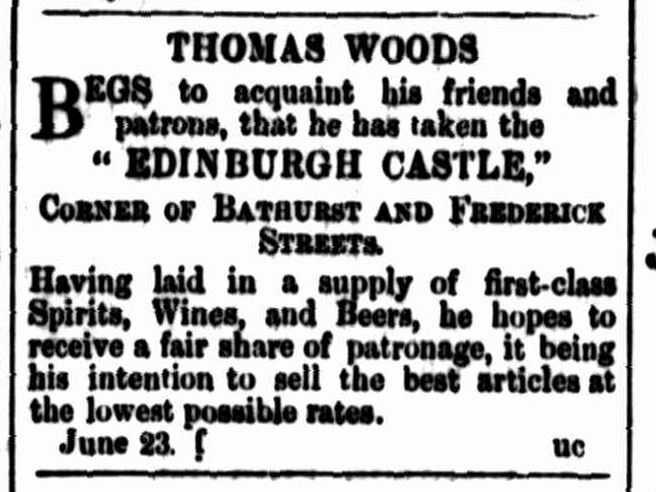 The Edinburgh Castle, Bathurst-street, from Thomas Woods to Henry A’Beavan. The Police Magistrate felt bound to oppose the granting of this application, as, since the permission to continue to sell under Wood’s license had been granted by himself and Mr. Same, he had received evidence that Beavan was living in adultery, and had been doing so for years ; that some years ago he was turned out of a lodge of Odd Fellows for drinking ; and although he had since left off drinking, he was still living in adultery. He felt bound to oppose the application. Mr. Sams was sorry to have to rise on such an occasion ; but he felt it his duty to say that Mr. Mason had been misinformed as to Beavan living in a state of adultery. Beavan was a married man, and as he had lived with him some years since he could say that a more honest or decent man was not living than Henry Beavan. But there were underhand enemies of Beavan, who were determined to oppose him, and it was doubtless from this source that Mr. Mason had obtained his information. It seemed, however, there was no objection before the meeting but the one of adultery, and he could say on his honor that was not true. Mr. Mason-Am I to understand from Mr. Sams that Beavan is not now living in adultery? Mr. Same said that was what now asserted. Dr. Ranson said a circumstance had come under his notice a short time back which proved Beavan was married. Mr. Mason said his reason for opposing was the fact that the original document of the Odd Fellows Society, which proved that Beavan was living in adultery at that time, had been shown to him. And Beavan had a wife in Victoria. Mr. Sams said what passed years ago could not affect a man now. As soon as Beavan was able to do so, he had married the woman he was now living with, and was now a respectable married man. The applicant produced his marriage certificate. Mr. Aikenhead, Mr. Buesnel, and other Justices expressed the opinion that the meeting was much indebted to the Police Magistrate for the information he had afforded. Mr. Gunn had always given all the information in his power, and the general opinion was that Mr, Mason was conferring a favor in following in his steps. The transfer was then granted. PERMISSION TO SELL.— Mr. Jas. Murphy has been granted permission to sell liquors at the Edinburgh Castle public-house, Bathurst-street, until next quarterly licensing meeting, under the license held by Mr. H. A’Bevan. PERMISSION To SELL..-At the Police Court yesterday morning Wm. 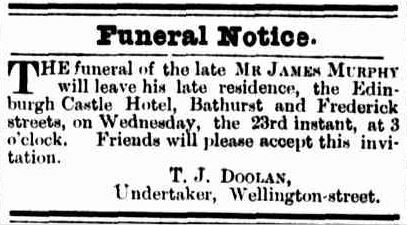 Doodie, landlord of the Salmon and Ball Hotel, Lower Charles-street, was granted permission to sell liquor at the T. M. L. Railway Station, at Launceston, to 31st December. 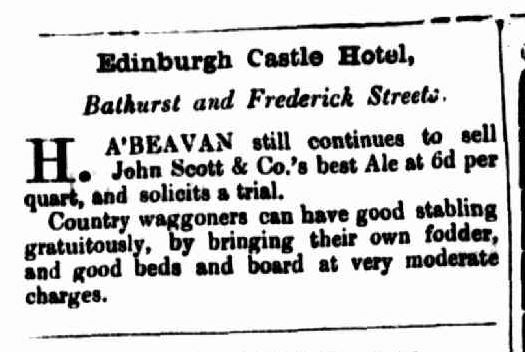 W. J. Spearman was also granted leave to sell liquor at the Edinburgh Castle Hotel, Wellington and Bathurst streets, under transfer from the administrators of the late James. Murphy, to the same date. Permission to Sell. 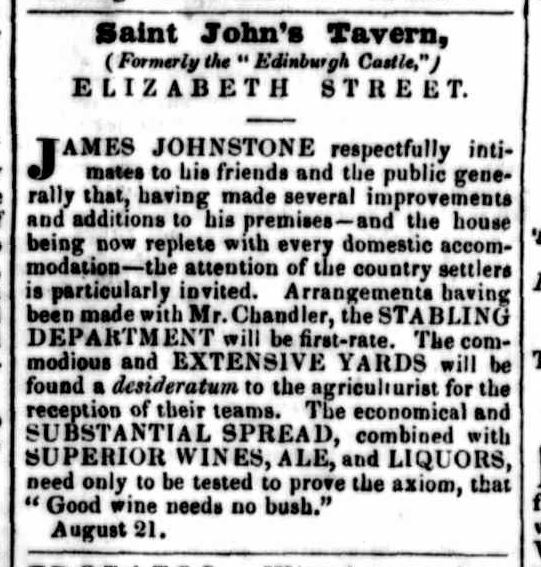 — John Chalmers was granted permission to continue to sell liquors at the Edinburgh Castle public-house, Bathurst street, until the next annual licensing meeting under the license held by William Spearman. 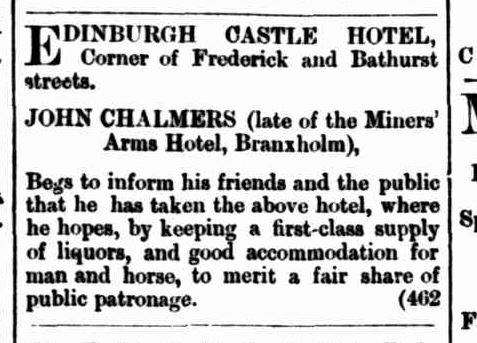 George Digney was also granted permission to sell liquors under the license held by John Chalmers, in respect of the Edinburgh Castle, until the next quarterly licensing meeting. Serious Stabbing Affray. — James Nelson was arrested yesterday for, having, on March 21, unlawfully stabbed, cut, and wounded George Monaghan. The affray occurred outside the Hill View Hotel, formerly known as the Old Edinburgh Castle, Hotel, at the corner of Bathurst and Frederick streets, opposite Portsmouth Square! Monaghan is a big stoutly ‘built man, while his assailant is, not above 5ft 6in, spare and wiry. The sufferer has been. stabbed in three places, above and below the knee, the most dangerous wound being in the groin. He was conveyed to the Hospital, and on enquiry last night we were informed that his condition was not considered dangerous. Hill View Hotel.— A memorial was received from residents in the vicinity of Portsmouth Square, stating that during the past few months the house had been the resort of many bad characters of both sexes, who created a nuisance in the neighborhood by their disgraceful behavior, and that as the public reserve upon which the hotel abuts was much frequented by the children from the Catholic and Infant schools, and was also the thoroughfare for a large number of residents in Margaret and other streets south of Frederick-street, preventive measures should be taken to ensure the better management, of the hotel. Mr C. T. Collins, in supporting the application, pointed out that the memorial was defective under the 24th section of the Act, and his client had been taken by surprise in it being brought forward. Improvements bad been made to the premises the year before last, and no complaint had been made during the past year. His client could not refuse to furnish persons, even if they were bad characters, with liquor under his license if they demanded it when sober, and had no power to drive them off the footpath or roadway if they were collected there. Superintendent Coulter said that. many of the b d characters who used to congregate in Wellington-street had been driven away from there by the more strict manner in which the houses in that locality were now conducted, and their presence was more noticeable in front of Digney’s house as the opposite corner was vacant. He had no!, had cause to complain of the way in which the house was conducted, but people of class stated would hang about a corner in the hope of getting a drink, and. of course. while anywhere it was offensive to other people, it was more noticeable in such a position as this, and became a nuisance to the publican and the passers-by. An opinion was passed by the Bench that no material improvements had been made to the premises and that the upstairs was a mere rookery. It was shown other publicans could keep their premises properly and he should he made to do so. Superintendent Coulter pointed out that if he had to lay a charge against a publican, he had to do so on evidence on which he was able to produce proof that was not likely to be shaken, and to aid in doing which the public were generally loth to come forward to give evidence, and he was not able to assert it in a general manner as those outside might do. The Bench, after a caution to the licensee that the matters brought forward would be recorded and considered on his next application, granted the license. 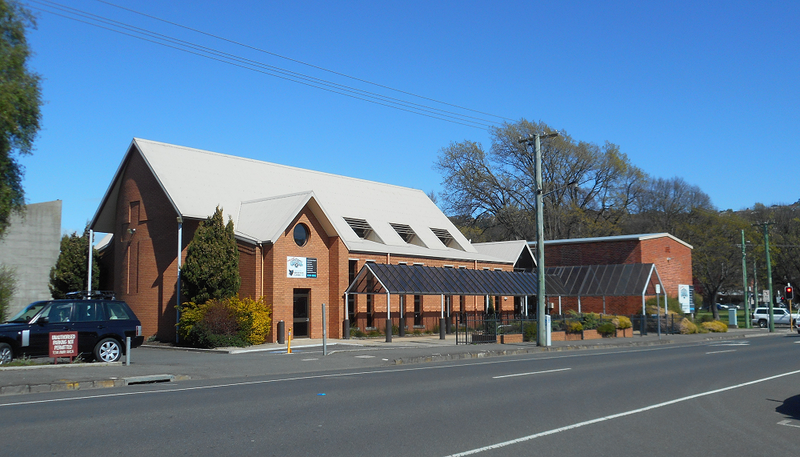 Mr. Thomas Maloney was granted permission on Monday to sell liquors under the public-house license held by Mr. George Digney, for the house known as the Hill View Hotel, Bathurst and Frederick streets, Launceston, until next meeting of the Licensing Bench. WELL-KEPT HOTEL. Probably few of the magistrates of the city have taken a deeper interest in the improvement of the licensed houses than does Mr Ernest Whitfeld, the chairman of the Licensing Bench. During the quarterly meeting of the bench yesterday he did not lose the opportunity of complimenting one who had consider ably improved the conduct of the business of one of these houses during his tenancy. It was in regard to the transfer of the license of the Hill View Hotel, Bathurst-street, that Mr Whitfeld made the remarks referred to. He said that the hotel had during the last twelve months been con ducted in a very respectable manner by Mr D.J. O’Farrell. For years it had been known as a house frequented by a questionable class of people, but Mr O’Farrell had altered that state of affairs. When transferring the license to the new occupier, Mr C. Kerslake, Mr Whitfeld expressed the hope that he would endeavour to keep up the good reputation the house had now gained. The licensee said he would endeavour to do so. Permission to Sell. — William Bass Thurstun was, on Saturday, at the Police Court, granted permission to sell liquors at the Hill View Hotel, under the license held by Charles Kerslake, until the next quarterly meeting of the Licensing Bench. INTERIM LICENSE.-Thomas Kirkwood was granted a transfer of license from Wm. Bass Thurston for the Hill View Hotel. Wm. Douglas Burns was granted permission to sell liquors at the Hill View Hotel, under the license held by Thomas Kirkwood, until the next meeting of the Licensing Bench. 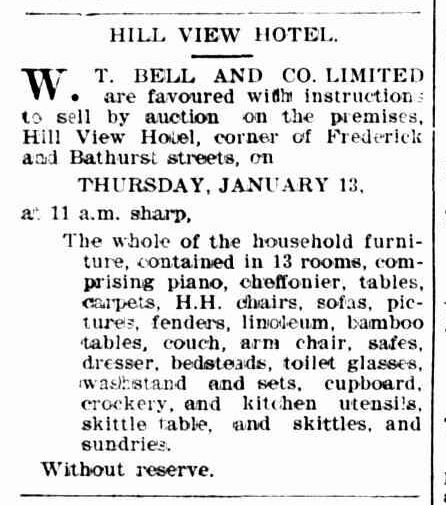 On the application of William Douglas Burns for a renewal of his license for the Hill View Hotel; Frederick and Bathurst streets, held by transfer, Superintendent Scoot reported that the house required considerable improvement, and that the holder of the license had had a conviction recorded against him. Mr. Sutton thought something should be done to put the house in a better condition. In the event of fire, too, he did not know how the occupants of the bedrooms could escape. It was a serious matter to take a license away, but if it was granted there should be a promise that the place would be put in repair, and some assurance that it would be carried out. The house was not fit for human beings to sleep in. The chairman-It ought not to be licensed. The Mayor suggested that a caution might meet the case, and that if something was not done by next year the license be refused. City Mission Headquarters.-The scheme for utilising the premises in Bathurst-street that used to be the Hill View Hotel as a headquarters of City Mission work on the lines indicated by the article which was published in Thursday’s “Examiner,” was discussed at a meeting of the committee of the mission, held last evening. Mr. R. L. Mason, the city missionary, explained his scheme, as outlined in our columns, and his idea upon the matter were very favourably received. The result of the evening’s discussion was that the Revs. S. Baker, A. P. Bladen, and W Beck, Messrs. E. Solomon, F. Stanfleld, W D. Weston, C. H. F. Shearn, M. Tyson, R. Gee, and C. Russen were appointed a sub-committee to investigate the scheme and report. It was decided that a letter of thanks be sent to the donor of the block’ of land mentioned in the “Examiner” article. ‘Mr. James Walden. The ground is at the corner of Twining and Bathurst streets. This entry was posted in Bathurst Street, Frederick Street, Hotel and tagged location, need better photo, photo by Xenith. Bookmark the permalink.